In this guide we are concerned with the format of the central block on the course home page containing the main content. Customising the blocks that appear on the left and right is covered in Move, delete Blocks. 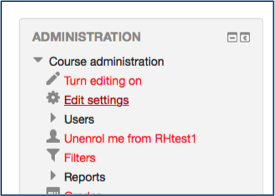 Log into Moodle and open the required course. To select a format for your course, go to the Administration block on the left and click Edit Settings to reveal a fairly long list of settings for your course. 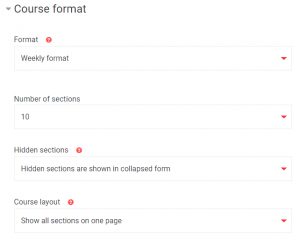 Scroll down to Course Format and click to expand it. Click the drop-down menu on Format to reveal the choice of formats. Select the required format from the list. If you are unsure which format you need, check the guidance in Course formats available at LSE and Best practice of course formats for structuring lengthy courses. N.B. 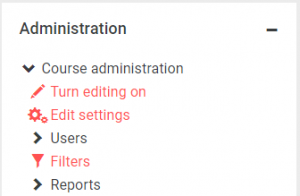 Changing the format of an existing course will not remove any content. It may rearrange it in a way that it will require some adjustment. In Number of sections, you can select the number of topics you wish to display. 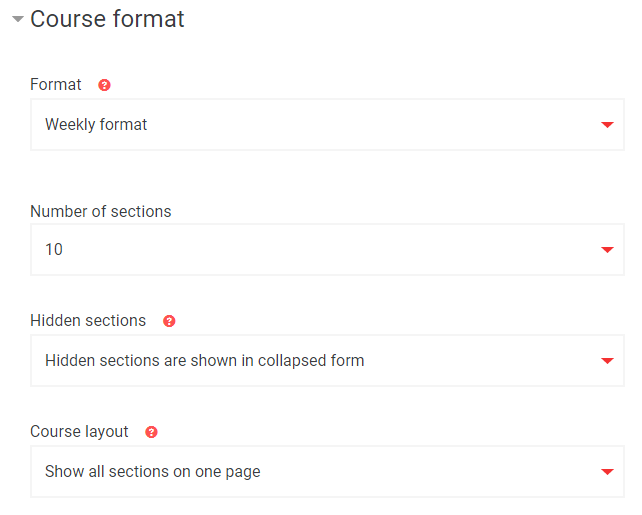 Make sure this is accurate if you are working on a course with existing content as setting the number too low means some content will not be visible. However, if you get it wrong, you can revise it without loss of content. Hidden sections. The default ‘Hidden sections are completely invisible’ is recommended unless you have a good reason to do otherwise. Course layout. Choose ‘Show one section per page’ if you want each section to be shown on its own page. Once you have made all your changes, click Save changes. N.B. You can return to these settings and revise them at any time.